Does a History of American Betrayal of the Philippines Have Anything to Do With Manny Pacquiao's Resistance to Mayweather's Demands? Even as every online poll on the question of who’s to blame for the demise of the Pacquiao-Mayweather fight show 80-90% of respondents blame Mayweather and his team, this past week saw a flurry of articles and commentary by sports journalists at ESPN, the New York Daily News, and elsewhere which place the blame for the demise of the fight squarely on Pacquiao and openly speculate that he must be “juicing” — how else could he possibly walk away from $40m over a few teaspoons of blood? In my own conversations with American friends, this same sentiment has been echoed — why would Manny not agree to the full testing protocol unless he has something to hide? Neither the casual American fans nor the journalists seem to consider relevant to the discussion the report that both Pacquiao and Mayweather tested clean in the recent random urine test ordered by the Nevada Boxing Commission, nor does it matter that Pacquiao has tested clean 11 times previously and has never had any brush with steroid purveyors or middlemen, nor does it seem to count for much that Pacquiao agreed to unlimited random urine testing plus blood testing immediately after the fight and any time up to 24 days before the fight. To these American critics, it all boils down to “he must be hiding something or else he would do it”. While there are some arguments for Pacquiao’s position that flow solely from boxing dynamics (i.e. not allowing Mayweather to gain the upper hand by giving him his way, etc), I keep coming back to the fact that Pacquiao’s actions and attitude make a lot more sense when you remember that he is a Filipino and Mayweather (as well as the US Anti-Doping Agency) are Americans, and this entire dispute looks different when you view it in the context of a century’s worth of what many if not most Filipinos regard as American bullying and betrayal of the people whom the first American governor General of the Philippines, William H. Taft (the same Taft who would become President) called our “little brown brothers” — a term that was not meant to be derogatory but which reeked of paternalistic racism that inspired Kipling to write of the “White Man’s Burden”. The fact that America, from a Philippine perspective, has a long history of betrayal and unfair (in the Filipino view) treatment of Filipinos is in my view a factor that has to be taken into consideration when one considers the dispute. 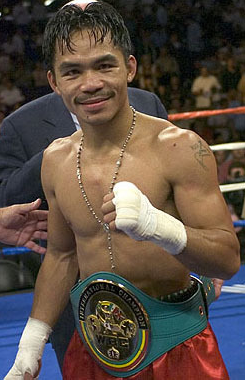 Indeed, Pacquiao has singlehandedly energized Filipinos and infused them with a sense of national pride that was sorely lacking prior to Pacquiao’s rise as the “National Fist” of the Philippines, and his actions in standing up to the bullying of the American Mayweather have been easily understood and widely applauded there. So here are some thoughts on the concept of America and our various betrayals and bullying of the Philippines. The image of Corazon Aquino taking the oath of office in 1986 in English, with words that are modeled on our own oath, is what caused me to first ask the question — why do they seem so much like us? They all have Spanish sounding names and were a Spanish colony (I remembered that much about the Philippines from school, not much more.) Why in English? Why so much like our oath? A few short months later my own life would take a crazy turn and by September of 1986 I was on a flight to Philippines, (which by the way is an archipelago with a population of 100m people, not the smallish island most Americans think it is). It would turn out that the Philippines would be my home for the next fifteen years, and so I got answers to my questions. But to this day I am astonished at how little most of us in the US understand about a people, and a country, with whom we have a long and intimate relationship–one that is unlike our relationship with any other country. So here are a few points I wish Americans would understand — and would apply to their analysis of the Pacquiao-Mayweather drug war. I apologize in advance to scholars, diplomats, and Filipinos who already know all this. My hope is that it will be read by Americans who are ignorant — as I was until 1986 — of the unique history and special relationship we have, or ought to have, with the Philipppines. 1. The Philippines was an American colony for 50 years: At the conclusion of the Spanish American war in 1898 (a war that came about as a result of American support for Cuban revolutionaries who sought independence from brutal Spanish colonial rule) America gave Cuba its independence but purchased Spain’s ‘other colony’, the Philippines, for $20M in a backroom deal that caught Filipinos by surprise and seemed to them to be a betrayal. 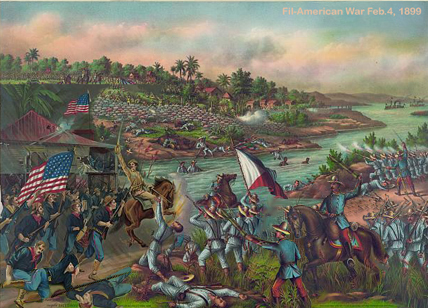 During the conflict between America and Spain, Philippine ‘insurrectos’ who had been fighting the Spanish for years had made common cause with American forces under Commodore George Dewey who defeated Spain, and Emilio Aguinaldo, the leader of the Filipino revolutionaries, reported that Commodore Dewey and others had promised the Filipinos their independence. So, the history of American-Philippine begins with what is perceived by Filipinos to be a betrayal. 2. The Filipinos fought a protracted and bloody war against American attempts to colonize their country. America gained control of the Philippines with the Treaty of Paris in December 1898; two months later in February the Filipinos began a war that ended up looking a lot like Vietnam would look 65 years later. 5,000 American troops died, and between 200,000 and 1.5m Filipinos perished. In a celebrated incident of that War, American General Jake “Howling” Smith gave orders to turn the Philippine province of Samar into a “howling wilderness” and explicitly gave orders to kill anyone over the age of 10. Smith was later courtmartialed. 3. American mounted a massive effort to educate Filipinos and install American instiatutions. During the colonial period, American worked diligently to mold the Philippines in an American image, sending thousands of teachers, educators, and aministrators. English was taught to schoolchildren who read from American textbooks; the institutions of the Philippine government were erected in the image of America’s own institutions. 4. The American colony of the Philippines was attacked at Clark Field within hours of Pearl Harbor, and the Filipinos proved to be America’s strongest ally in Asia during WWII. Major elements of the Philippine Commonwealth Army, formed in 1935 as tensions in Asia were growing, was integrated into the American Army and the joint force, under the name United States Armed Forces Far East, was placed under the command of then retired general Douglas MacArthur, who had been born and raised in the Philippines while is father, Arthur MacArthur, was the military governor general there. The Filipinos who fought side by side with Americans in USAFFE, and in the U.S. Navy, have fought for veterans benefits for half a century. 5. America supported the Ferdinand Marcos dictatorship for 14 years even though it had suspended all democractic institutions, placing the military in charge and torturing, imprisoning, and killing oppositionists who sought a return to democracy. America’s support to Marcos continued even after the fraudulent elections in 1985 in which Marcos clearly stole the election from Corazon Aquino. When the “People Power” revolution swept Aquino to power, the US finally gave up on Marcos but even then, US President Ronald Reagan called and communicated with Marcos in arranging his helicopter extrication — and never called the new President, Aquino for almost two months after she came to power. The suspicion among Filipinos — and especially Philippine military– that America secretly continued to back Marcos and would support a military led coup against Aquino fueled 7 coup attempts from 1986-1989. A term that Filipinos have used to describe their relationship with America is “sa kuko ng aguila” — ‘in the claws of the eagle’. Manny Pacquiao was not about to let himself be prey in Mayweather’s arrogant American claws when Mayweather was making unprecedented demands for blood-testing which carried with it the implicit (and explicit) accusation that Pacquiao has been a cheat; that his success is a fraud. His position as the emblem of hope and honor for a country would not allow it. I am convinced he went as far as he could, and his reason for walking away when he did had everything to do with personal and national character, and nothing to do with cheating.